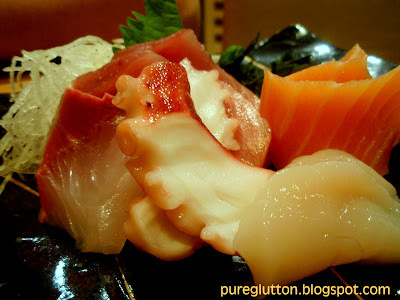 Mention “Rakuzen” only and many people would associate “decent Japanese food” with it. Their outlet in Subang has been in existence for quite a while and we have been there many times but I have yet to blog about it. 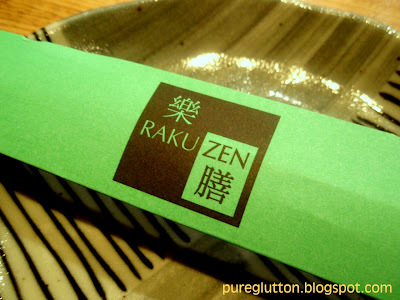 Rakuzen is extremely popular – and unless you go there very early, you will have to wait for quite a bit if you didn’t make any booking! It is wise to book your table early, to avoid disappointment. On the few occasions that I was there, there was a pretty long queue waiting outside the restaurant! I like their simplistic decor – on the Ground Floor, wooden tables flanked one side while the other side is taken up by a long countertop where you can see the crew slicing the raw stuff, wrapping handrolls, saute’ing teppanyaki etc. On the 1st Floor, the tables are laid out tatami-style… open hall as well as a few private rooms. Nabe Udon Set – that’s what NL ordered. 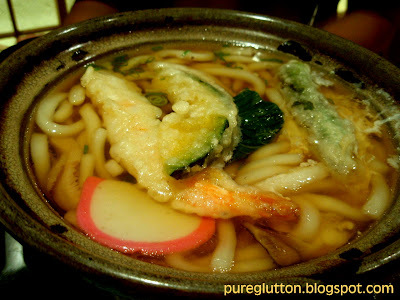 A huge claypot of simmering udon with an assortment of tempura floating on top. 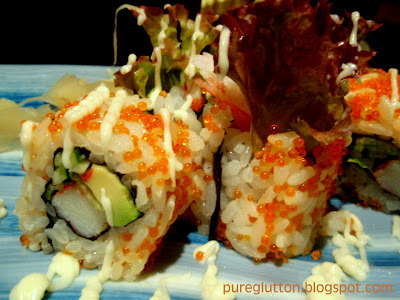 The set came with California Maki (below) too, in addition to the chawanmushi, miso soup, salad, pickles and fruits. All for RM38. 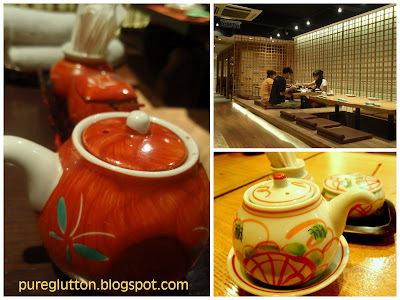 Sukiyaki Zen set (RM38) … also came with all the extra little side dishes. 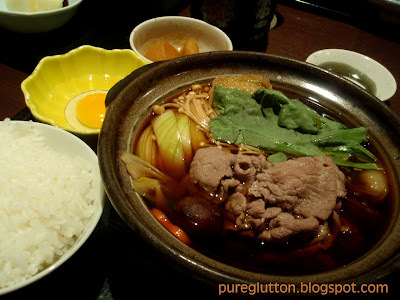 My grouse was that the sukiyaki was not hot enough – the soup was just warm when the pot reached our table! California Maki @ RM8 each – these must have been left for sometime after they have been rolled because by the time they were served, the seaweed sheets were damp and chewy. Not good! This was the Hama Platter (RM45). 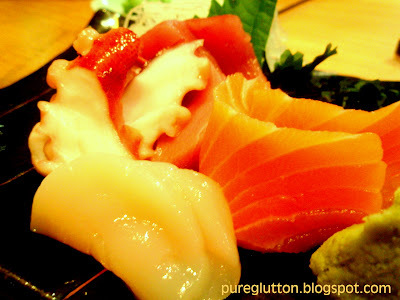 No complaints about this as both DL and LL wolfed down those superfresh pieces of raw salmon, octopus and butterfish! 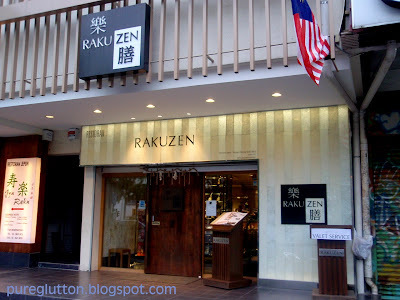 Still not satiated with that platter of raw fish, LL ordered his favourite Sakura Zen set (RM38). This big box contained rice (which you can hardly see due to all the toppings!) 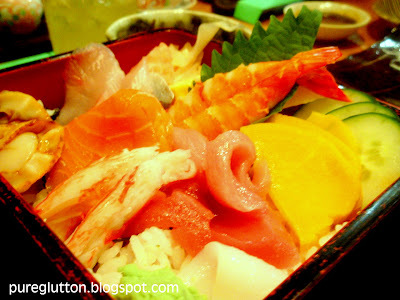 and generous pieces of shrimps, salmon, hotate, squid, butterfish and crabstick. All these were accompanied by the small side dishes I mentioned earlier. 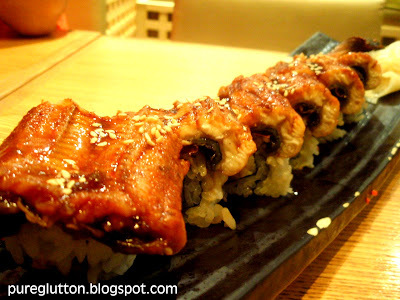 Now, if you still have room in your tummy after all of the above, why not try their Stamina Roll (RM28)? You won’t be disappointed with the thick slabs of fat juicy unagi curling round the sushi rice. Really, those unagi pieces totally overwhelmed the rice, I tell you! The Toufu Kinoko (RM20) was a mistake. 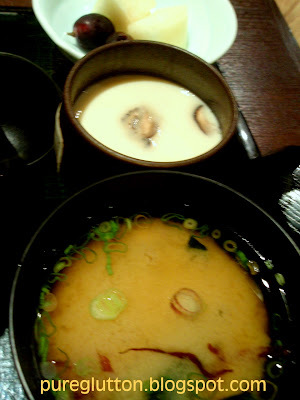 It was a big round slab of tofu drowned in a starchy soup with mushrooms. It was served lukewarm but worst of all, it was quite tasteless. 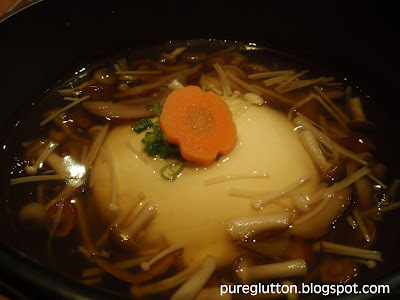 So, even if you are a tofu fan like me, do not order this! Ahh… but I love their salads! 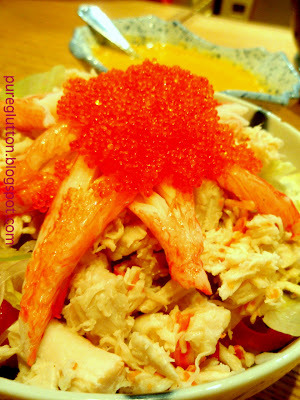 I ordered this in almost every meal we had there – their Hako Kani Salad (RM18 for small portion). I just love the flying fish roe topping – the popping sound they make when you bite on them – nice! The crabstick & crabmeat, the crisp vegetables – all very fresh & tasty. The Tempura Mori (RM26) platter was so-so… nothing spectacular, I would say. 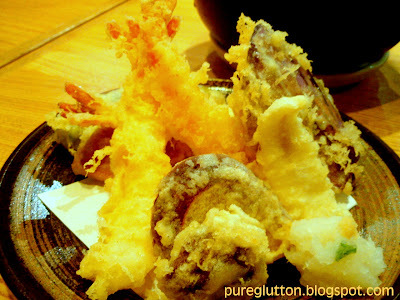 Order this only if you must have tempura with your meal! 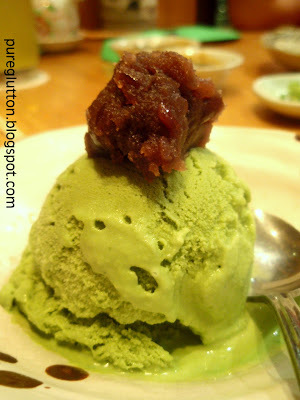 Now for the desserts… Macha Icecream (RM6)… very strong green tea-flavoured icecream topped with a dollop of red bean paste – yummy! 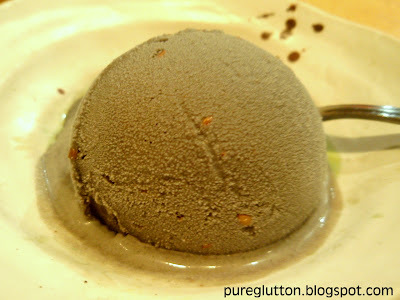 Goma Icecream (RM6) – black sesame icecream! Also very yummy! Generally I do love their icecreams here as they are very full-bodied, rich and creamy…. and oh, not too sweet either! Given the few misses,… well, the hits counted more… this still remains one of our favourite neighbourhood Japanese food joint. wah.. japanese food.. fernie will love this… ice cream some more.. can take me there next time? do they still have the Sunday buffet lunch? still rmbr this place was among the MOST blogged about Japanese restaurant, and with loads of positive feedback to boot. J2Kfm: Dont think they have any buffet spread now – their a'la carte biz is doing too well, lol! 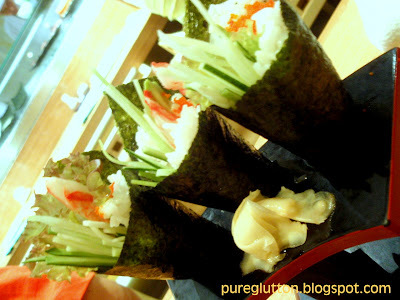 Unka: Then perhaps it's time u make your way there again – it's healthy food, haha! the cold soba is the best!